Younger stars have a cloud of dusty debris encircling them, called a circumstellar disk. This disk is material left over from the star’s formation, and it’s out of this material that planets form. But scientists using the Hubble have been studying an enormous dust structure some 150 billion miles across. Called an exo-ring, this newly imaged structure is much larger than a circumstellar disk, and the vast structure envelops the young star HR 4796A and its inner circumstellar disk. Discovering a dust structure around a young star is not new, and the star in this new paper from Glenn Schneider of the University of Arizona is probably our most (and best) studied exoplanetary debris system. But Schneider’s paper, along with capturing this new enormous dust structure, seems to have uncovered some of the interplay between the bodies in the system that has previously been hidden. Schneider used the Space Telescope Imaging Spectrograph (STIS) on the Hubble to study the system. The system’s inner disk was already well-known, but studying the larger structure has revealed more complexity. The origin of this vast structure of dusty debris is likely collisions between newly forming planets within the smaller inner ring. Outward pressure from the star HR 4769A then propelled the dust outward into space. The star is 23 times more luminous than our Sun, so it has the necessary energy to send the dust such a great distance. A press release from NASA describes this vast exo-ring structure as a “donut-shaped inner tube that got hit by a truck.” It extends much further in one direction than the other, and looks squashed on one side. The paper presents a couple possible causes for this asymmetric extension. It could be a bow wave caused by the host star travelling through the interstellar medium. Or it could be under the gravitational influence of the star’s binary companion (HR 4796B), a red dwarf star located 54 billion miles from the primary star. “The dust distribution is a telltale sign of how dynamically interactive the inner system containing the ring is'” – Glenn Schneider, University of Arizona, Tucson. The asymmetrical nature of the vast exo-structure points to complex interactions between all of the stars and planets in the system. We’re accustomed to seeing the radiation pressure from the host star shape the gas and dust in a circumstellar disk, but this study presents us with a new level of complexity to account for. And studying this system may open a new window into how solar systems form over time. “We cannot treat exoplanetary debris systems as simply being in isolation. Environmental effects, such as interactions with the interstellar medium and forces due to stellar companions, may have long-term implications for the evolution of such systems. The gross asymmetries of the outer dust field are telling us there are a lot of forces in play (beyond just host-star radiation pressure) that are moving the material around. We’ve seen effects like this in a few other systems, but here’s a case where we see a bunch of things going on at once,” Schneider further explained. The paper suggests that the location and brightness of smaller rings within the larger dust structure places constraints on the masses and orbits of planets within the system, even when the planets themselves can’t be seen. But that will require more work to determine with any specificity. This paper represents a refinement and advancement of the Hubble’s imaging capabilities. The paper’s author is hopeful that the same methods using in this study can be used on other similar systems to better understand these larger dust structures, how they form, and what role they play. It might seem incongruous to find water ice in the disk of gas and dust surrounding a star. Fire and ice just don’t mix. We would never find ice near our Sun. But our Sun is old. About 5 billion years old, with about 5 billion more to go. Some younger stars, of a type called Herbig Ae/Be stars (after American astronomer George Herbig,) are so young that they are surrounded by a circumstellar disk of gas and dust which hasn’t been used up by the formation of planets yet. For these types of stars, the presence of water ice is not necessarily unexpected. Water ice plays an important role in a young solar system. Astronomers think that water ice helps large, gaseous, planets to form. The presence of ice makes the outer section of a planetary disk more dense. This increased density allows the cores of gas planets to coalesce and form. Young solar systems have what is called a snowline. It is the boundary between terrestrial and gaseous planets. Beyond this snowline, ice in the protoplanetary disk encourages gas planets to form. Inside this snowline, the lack of water ice contributes to the formation of terrestrial planets. You can see this in our own Solar System, where the snowline must have been between Mars and Jupiter. A team of astronomers using the Gemini telescope observed the presence of water ice in the protoplanetary disk surrounding the star HD 100546, a Herbig Ae/Be star about 320 light years from us. At only 10 million years old, this star is rather young, and it is a well-studied star. The Hubble has found complex, spiral patterns in the disk, and so far these patterns are unexplained. HD 100546 is also notable because in 2013, research showed the probable ongoing formation of a planet in its disk. This presented a rare opportunity to study the early stages of planet formation. Finding ice in the disk, and discovering how deep it exists in the disk, is a key piece of information in understanding planet formation in young solar systems. Finding this ice took some clever astro-sleuthing. The Gemini telescope was used, with its Near-Infrared Coronagraphic Imager (NICI), a tool used to study gas giants. The team installed H2O ice filters to help zero in on the presence of water ice. The protoplanetary disk around young stars, as in the case of HD 100546, is a mixed up combination of dusts and gases, and isolating types of materials in the disk is not easy. Water ice has been found in disks around other Herbig Ae/Be stars, but the depth of distribution of that ice has not been easy to understand. This paper shows that the ice is present in the disk, but only shallowly, with UV photo desorption processes responsible for destroying water ice grains closer to the star. It may seem trite so say that more study is needed, as the authors of the study say. But really, in science, isn’t more study always needed? Will we ever reach the end of understanding? Certainly not. And certainly not when it comes to the formation of planets, which is a pretty important thing to understand. The currently accepted theory of planet formation goes like this: clouds of gas and dust are compressed or begin to draw together. When enough material clumps together, a star is formed and begins fusion. As the star, and its cloud of gas and dust rotate, other clumps of matter coagulate within the cloud, eventually forming planets. Voila, solar system. There’s lots of evidence to support this, but getting a good look at the early stages of planetary formation has been difficult. But now, an international team of astronomers using the Karl G. Jansky Very Large Array (VLA) have captured the earliest image yet of the process of planetary formation. “We believe this clump of dust represents the earliest stage in the formation of protoplanets, and this is the first time we’ve seen that stage,” said Thomas Henning, of the Max Planck Institute for Astronomy (MPIA). This story actually started back in 2014, when astronomers studied the star HL Tau and its dusty disk with the Atacama Large Millimetre/sub-millimetre Array (ALMA.) That image, which showed gaps in HL Tau’s proto-planetary disk caused by proto-planets sweeping up dust in their orbits, was at the time the earliest image we had of planet formation. HL Tau is only about a million years old, so planet formation in HL Tau’s system was in its early days. Now, astronomers have studied the same star, and its disk, with the VLA. The capabilities of the VLA allowed them do get an even better look at HL Tau and its disk, in particular the denser area closest to the star. What VLA revealed was a distinct clump of dust in the innermost region of the disk that contains between 3 to 8 times the mass of the Earth. That’s enough to form a few terrestrial planets of the type that inhabit our inner Solar System. “This is an important discovery, because we have not yet been able to observe most stages in the process of planet formation,” said Carlos Carrasco-Gonzalez from the Institute of Radio Astronomy and Astrophysics (IRyA) of the National Autonomous University of Mexico (UNAM). Of course the star in question, HL Tau, is interesting as well. But the formation and evolution of stars is much more easily studied. It’s our theory of planet formation which needed some observational confirmation. “This is quite different from the case of star formation, where, in different objects, we have seen stars in different stages of their life cycle. With planets, we haven’t been so fortunate, so getting a look at this very early stage in planet formation is extremely valuable,” said Carrasco-Gonzalez. ALMA Shows Off Baby Pictures… Baby Planets, That Is! In a test of its new high resolution capabilities, the Atacama Large Millimeter/submillimeter Array (ALMA) is happily sharing some family snapshots with us. Astronomers manning the cameras have captured one of the best images so far of a newly-forming planet system gathering itself around a recently ignited star. Located about 450 light years from us in the constellation of Taurus, young HL Tau gathers material around it to hatch its planets and fascinate researchers. Thanks to ALMA images, scientists have been able to witness stages of planetary formation which have been suspected, but never visually confirmed. This very young star is surrounded by several concentric rings of material which have neatly defined spacings. Is it possible these clearly marked gaps in the solar rubble disc could be where planets have started to gel? “These features are almost certainly the result of young planet-like bodies that are being formed in the disk. This is surprising since HL Tau is no more than a million years old and such young stars are not expected to have large planetary bodies capable of producing the structures we see in this image,” said ALMA Deputy Director Stuartt Corder. “When we first saw this image we were astounded at the spectacular level of detail. HL Tauri is no more than a million years old, yet already its disc appears to be full of forming planets. This one image alone will revolutionize theories of planet formation,” explained Catherine Vlahakis, ALMA Deputy Program Scientist and Lead Program Scientist for the ALMA Long Baseline Campaign. Through repeated research, astronomers suspect that all stars are created when clouds of dust and gas succumb to gravity and collapse on themselves. As the star begins to evolve, the dust binds together – turning into “solar system soup” consisting of an array of different sized sand and rocks. This rubble eventually congeals into a thin disc surrounding the parent star and becomes home to newly formed asteroids, comets, and planets. As the planets collect material into themselves, their gravity re-shapes to structure of the disc which formed them. Like dragging a lawn sweeper over fallen leaves, these planets clear a path in their orbit and form gaps. Eventually their progress pulls the gas and dust into an even tighter and more clearly defined structure. Now ALMA has shown us what was once only a computer model. Everything we thought we knew about planetary formation is true and ALMA has proven it. “This new and unexpected result provides an incredible view of the process of planet formation. Such clarity is essential to understand how our own solar system came to be and how planets form throughout the universe,” said Tony Beasley, director of the National Radio Astronomy Observatory (NRAO) in Charlottesville, Virginia, which manages ALMA operations for astronomers in North America. “Most of what we know about planet formation today is based on theory. Images with this level of detail have up to now been relegated to computer simulations or artist’s impressions. This high resolution image of HL Tauri demonstrates what ALMA can achieve when it operates in its largest configuration and starts a new era in our exploration of the formation of stars and planets,” says Tim de Zeeuw, Director General of ESO. The major reason astronomers have never seen this type of structure before is easy to envision. The very dust which creates the planetary disc around HL Tau also conceals it to visible light. Thanks to ALMA’s ability to “see” at much longer wavelengths, it can image what’s going on at the very heart of the cloud. “This is truly one of the most remarkable images ever seen at these wavelengths. The level of detail is so exquisite that it’s even more impressive than many optical images. The fact that we can see planets being born will help us understand not only how planets form around other stars but also the origin of our own solar system,” said NRAO astronomer Crystal Brogan. How does ALMA do it? According to the research staff, its new high-resolution capabilities were achieved by spacing the antennas up to 15 kilometers apart. This baseline at millimeter wavelengths enabled a resolution of 35 milliarcseconds, which is equivalent to a penny as seen from more than 110 kilometers away. “Such a resolution can only be achieved with the long baseline capabilities of ALMA and provides astronomers with new information that is impossible to collect with any other facility, including the best optical observatories,” noted ALMA Director Pierre Cox. Pass them baby pictures our way, Mama ALMA… We’re delighted to take a look! Stars and planets form out of vast clouds of dust and gas. Small pockets in these clouds collapse under the pull of gravity. But as the pocket shrinks, it spins rapidly, with the outer region flattening into a disk. Eventually the central pocket collapses enough that its high temperature and density allows it to ignite nuclear fusion, while in the turbulent disk, microscopic bits of dust glob together to form planets. Theories predict that a typical dust grain is similar in size to fine soot or sand. In recent years, however, millimeter-size dust grains — 100 to 1,000 times larger than the dust grains expected — have been spotted around a few select stars and brown dwarfs, suggesting that these particles may be more abundant than previous thought. Now, observations of the Orion nebula show a new object that may also be brimming with these pebble-size grains. 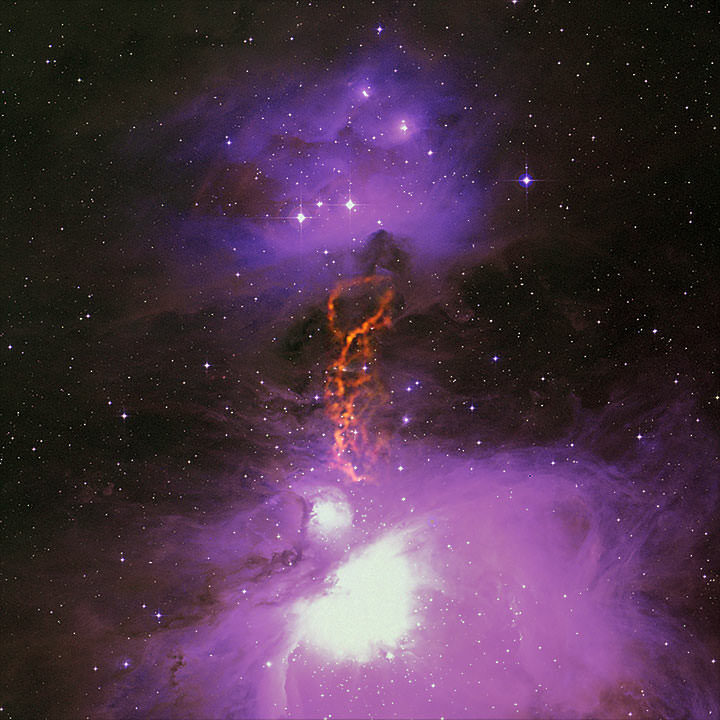 The team used the National Science Foundation’s Green Bank Telescope to observe the northern portion of the Orion Molecular Cloud Complex, a star-forming region that spans hundreds of light-years. It contains long, dust-rich filaments, which are dotted with many dense cores. Some of the cores are just starting to coalesce, while others have already begun to form protostars. Based on previous observations from the IRAM 30-meter radio telescope in Spain, the team expected to find a particular brightness to the dust emission. Instead, they found that it was much brighter. Such massive dust grains are hard to explain in any environment. Around a star or a brown dwarf, it’s expected that drag forces cause large particles to lose kinetic energy and spiral in toward the star. This process should be relatively fast, but since planets are fairly common, many astronomers have put forth theories to explain how dust hangs around long enough to form planets. One such theory is the so-called dust trap: a mechanism that herds together large grains, keeping them from spiraling inward. But these dust particles occur in a rather different environment. So the researchers propose two new intriguing theories for their origin. The first is that the filaments themselves helped the dust grow to such colossal proportions. These regions, compared to molecular clouds in general, have lower temperatures, high densities, and lower velocities — all of which encourage grain growth. The second is that the rocky particles originally grew inside a previous generation of cores or even protoplanetary disks. The material then escaped back into the surrounding molecular cloud. This finding further challenges theories of how rocky, Earth-like planets form, suggesting that millimeter-size dust grains may jump-start planet formation and cause rocky planets to be much more common than previously thought. The paper has been accepted for publication in the Monthly Notices of the Royal Astronomical Society. Why Isn’t the Asteroid Belt a Planet? It seems like there’s a strange gap in between Mars and Jupiter filled with rocky rubble. Why didn’t the asteroid belt form into a planet, like the rest of the Solar System? Beyond the orbit of Mars lies the asteroid belt its a vast collection of rocks and ice, leftover from the formation of the solar system. It starts about 2 AU, ends around 4 AU. Objects in the asteroid belt range from tiny pebbles to Ceres at 950 km across. Star Wars and other sci-fi has it all wrong. The objects here are hundreds of thousand of kilometers apart. There’d be absolutely no danger or tactical advantage to flying your spacecraft through it. To begin with, there actually isn’t that much stuff in the asteroid belt. If you were to take the entire asteroid belt and form it into a single mass, it would only be about 4% of the mass of our Moon. Assuming a similar density, it would be smaller than Pluto’s moon Charon. In fact, when we look at the chemical compositions of different asteroids we see that they can be grouped into different families, with each having a common origin. This gives us a clue as to why a planet didn’t form where the asteroid belt is. If you arrange all the asteroids in order of their average distance from the Sun, you find they aren’t evenly distributed. Instead you find a bunch, then a gap, then a bunch more, then another gap, and so on. These gaps in the asteroid belt are known as Kirkwood gaps, and they occur at distances where an orbit would be in resonance with the orbit of Jupiter. Jupiter’s gravity is so strong, that it makes asteroid orbits within the Kirkwood gaps unstable. It’s these gaps that prevented a single planetary body from forming in that region. So, because of Jupiter, asteroids formed into families of debris, rather than a single planetary body. What do you think? What’s your favorite object in the asteroid belt. Tell us in the comments below. Take a close look at the blurry image above. See that gap in the cloud? That could be a planet being born some 176 light-years away from Earth. It’s a small planet, only 6 to 28 times Earth’s mass. This alien world, if we can confirm it, shouldn’t be there according to conventional planet-forming theory. The gap in the image above — taken by the Hubble Space Telescope — probably arose when a planet under construction swept through the dust and debris in its orbit, astronomers said. That’s not much of a surprise (at first blush) given what we think we know about planet formation. You start with a cloud of debris and gas swirling around a star, then gradually the bits and pieces start colliding, sticking together and growing bigger into small rocks, bigger ones and eventually, planets or gas giant planet cores. But there’s something puzzling astronomers this time around: this planet is a heck of a long way from its star, TW Hydrae, about twice Pluto’s distance from the sun. Given that alien systems’ age, that world shouldn’t have formed so quickly. 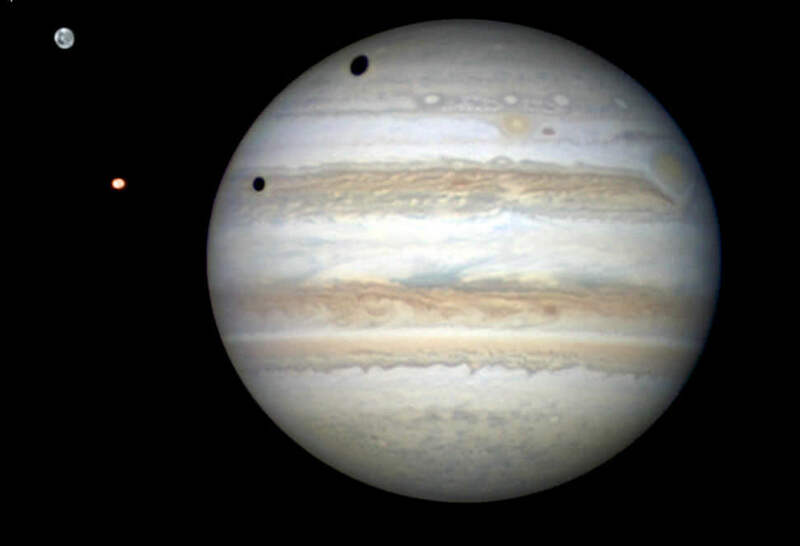 Astronomers believe that Jupiter took about 10 million years to form at its distance away from the sun. This planet near TW Hydrae should take 200 times longer to form because the alien world is moving slower, and has less debris to pick up. But something must be off, because TW Hydrae‘s system is believed to be only 8 million years old. “There has not been enough time for a planet to grow through the slow accumulation of smaller debris. Complicating the story further is that TW Hydrae is only 55 percent as massive as our sun,” NASA stated, adding it’s the first time we’ve seen a gap so far away from a low-mass star. The lead researcher put it even more bluntly: “Typically, you need pebbles before you can have a planet. So, if there is a planet and there is no dust larger than a grain of sand farther out, that would be a huge challenge to traditional planet formation models,” stated John Debes, an astronomer at the Space Telescope Science Institute in Baltimore. At this point, you would suppose the astronomers are seriously investigating other theories. One alternative brought up in the press release: perhaps part of the disc collapsed due to gravitational instability. If that is the case, a planet could come to be in only a few thousand years, instead of several million. There’s a trick with the “direct collapse” theory, though: astronomers believe it takes a bunch of matter that is one to two times more massive than Jupiter before a collapse can occur to form a planet. Recall that this world is no more than 28 times the mass of Earth, as best as we can figure. Well, Jupiter itself is 318 times more massive than Earth. There are also intriguing results about the gap. Chile’s Atacama Large Millimeter/submillimeter Array (ALMA) — which is designed to look at dusty regions around young stars — found that the dust grains in this system, orbiting nearby the gap, are still smaller than the size of a grain of sand. Astronomers plan to use ALMA and the James Webb Space Telescope, which should launch in 2018, to get a better look. In the meantime, the results will be published in the June 14 edition of the Astrophysical Journal. There’s enough water in a planet-forming disk around a distant star to fill several thousand Earth oceans, according to new observations with the Herschel space observatory. Astronomers have found evidence of water vapor originating from ice on dust grains in the disc around a young star, TW Hydrae. The star is between 5-10 million years old, so is in its final stages of formation. Herschel has found water around other stars, such as an old red giant star CW Leonis, and other telescopes like Spitzer have also observed abundant water in nascent planet forming regions around other stars. But scientists say this latest research from Herschel breaks new ground in understanding water’s role in planet-forming discs and gives scientists a new testing ground for looking at how water came to our own planet. “With Herschel we can follow the trail of water through all the steps of star and planet formation,” said Göran Pilbratt, Herschel Project Scientist at ESA. Scientists think the water vapor signature is produced when the ice coated dust grains are warmed by interstellar UV radiation. Read more on this discovery at the ESA Herschel website.